In Netsparker Enterprise, you can only make a whole scan export. It is not possible to export a single vulnerability. Should you wish to import a single vulnerability rule, you can manually modify the exported ModSecurity configuration file. In Netsparker Standard, it is possible to either export the information about a single vulnerability as a ModSecurity rule or export information about all the vulnerabilities identified during the scan. The ModSecurity web application firewall (WAF) will then block any requests made by malicious hackers. Netsparker scanners will automatically choose the type of rule depending on the vulnerability, so you do not have to configure anything. Not all vulnerabilities can be covered up by blocking access to a specific URL with a web application firewall, therefore not all vulnerabilities can be exported as ModSecurity rules. For example, security flaws related to HTTP Cookies, sensitive comments in source code, application source code disclosure and other similar vulnerabilities will not be exported. In Netsparker Enterprise, you can also export the information about the identified vulnerabilities as rules for the ModSecurity web application firewall. Next to the relevant scan, click Report. The Executive Summary window is displayed. Click Export. The Export Report dialog box is displayed. From the Report dropdown, select ModSecurity WAF Rules. From the Format dropdown, select TXT. Click Export. The Save As dialog opens. Select a save location and click Save. You can then use the downloaded rules in your web application firewall. Once a scan has finished, navigate to the Issues pane and select a single vulnerability (in this example, Cross-site Scripting). From the Reporting tab, click ModSecurity WAF Rules. The Save Report As dialog is displayed. In the Filename field, enter a name, and click Save. The Export Report dialog is displayed with the Path (generated from the location and filename from the previous step) already displayed. From the Policy dropdown, select an option. The Open Generated Report checkbox is already selected (which opens the report on completion). Deselect this option if required. Click Save. 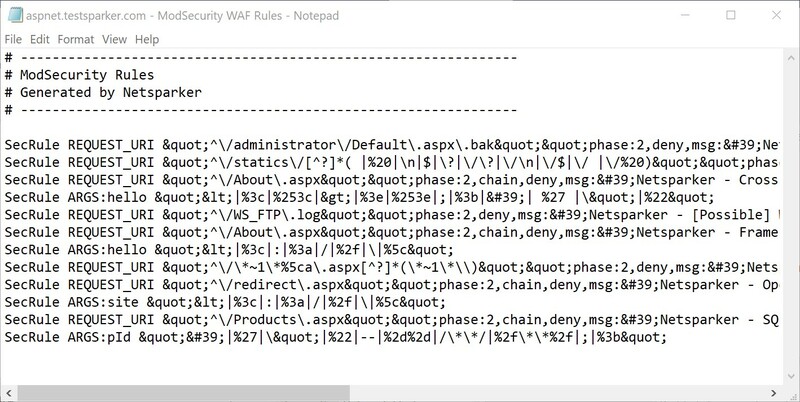 The ModSecurity WAF Rules Report opens in your default text editor (this example shows Notepad).